Revamping the space of a former sushi restaurant on Des Sources, Carribean Tasty Treats (spelt like so on purpose) has a mission to bring the West Island a taste of of the tropical islands. With a huge poster of Bob Marley on the wall and a calming beach landscape adjacent to it, the place attempts to bring diners to a warmer climate despite the erratic precipitation falling just outside the door. There is nothing quite like spicy jerk chicken and a glass of cold Red Stripe to take you there, amiright? Reading the weekend Gazette paper, we came across Sarah Musgrave’s review of the place – it being a couple of minutes away from us, we decided to give the place a shot for lunch. Nondescript and seemingly unassuming from the exterior, Carribean Tasty Treats is easy to miss. Located on the edge of a small strip mall not too far away from Adonis, there is parking a plenty in front of the restaurant. We went into the place with anticipation – none of us had had real Jamaican food in a long time. 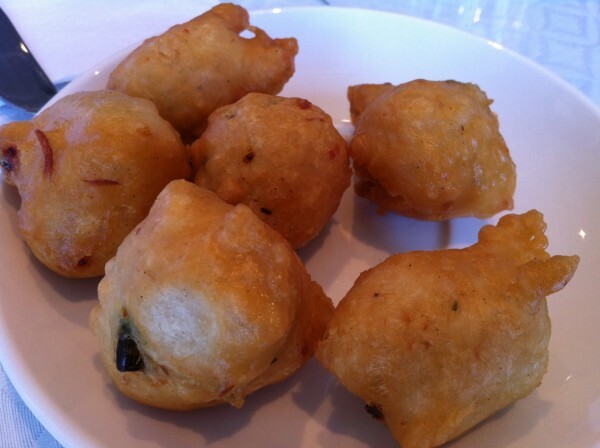 A plate of fish balls came to our table first, complimentary of the house. They were hot, chewy and quite delicious with the house made hot sauce on the table. I would be careful with how liberally you douse your food with the sauce – it is very – I repeat – very spicy. You have been warned. The red snapper, referred to as a one of those “monsters” you see swimming around when scuba diving in Jamaica by the owner, Donat Campbell, came next. 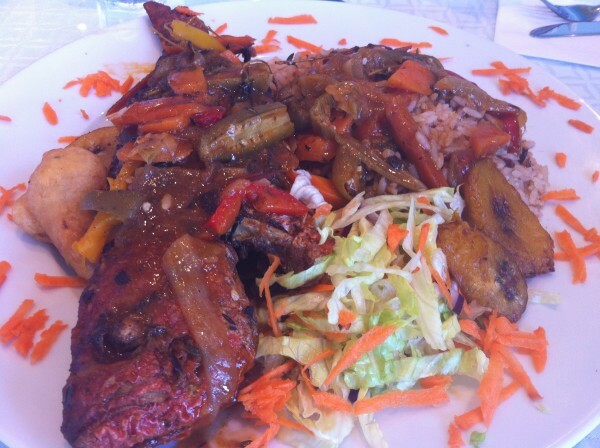 Accompanied by some rice, salad and the customary plantains, the fish was one of the real highlights of the meal. Two of the three of us found it to be the best dish of the meal. Tender, flaky and full of flavor, the fish came off the bone nicely and tasted great even without any toppings. The salad and the rice are forgettable though – they are standard at best. The texture of the rice actually reminded me of Uncle Ben’s minute rice… Needless to say, those were the most untouched items on all of our plates. 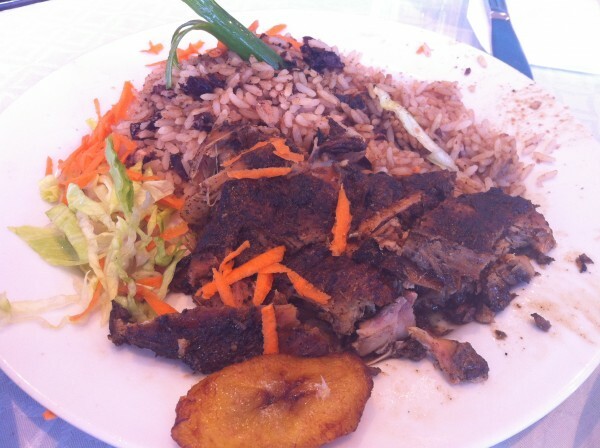 Next, we got the jerk chicken – how could we not?! Marinated for over a week in a special sauce, this is a method that is used in order to get the flavours and spices to really sink into the meat all the way down to the bone. Donat was explicit about this part; almost all the meats served here undergo the same process, ensuring a rich, textured taste with every bite. And you can tell, too. The charcoal grilled meat was juicy and tasty – better than we had even imagined. The goat roti was the last of our mains. 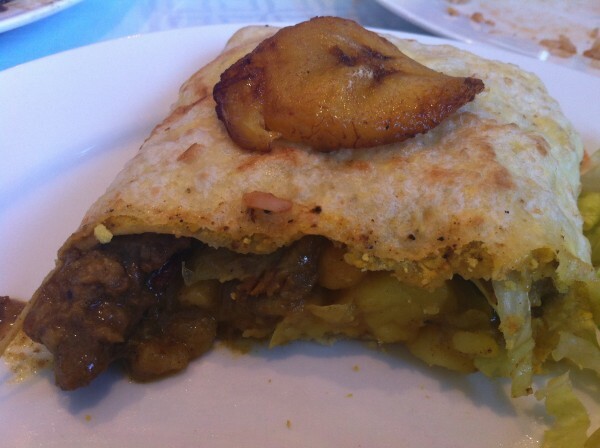 The mixture of potato pieces and chunks of goat meat proved to be a filling combination. The goat was actually my favourite – the taste and the ultra smooth/soft/tender texture was unbeatable. Filling the thin, unleavened bread to the point of bursting, this dish is one that will have you clutching at your stomach by the time you finish it. Note that you can change the meat inside depending on what you prefer. If you’re in the neighbourhood, check out Tasty Treats for some authentic Caribbean fare at affordable prices. Tags: Caribbean, Des Sources, Fish Cakes, forkandtell, Goat, Goat Roti, Hot Sauce, Jamaican, Jerk Chicken, Potato, red snapper, Rice, Roti, Salad.